Will plant intelligence compel future spacefarers to carry chili peppers? © Tomas Castelazo. CC BY-SA 4.0. Stefano Mancuso’s book The Revolutionary Understanding of Plants: A New Understanding of Plant Intelligence and Behavior (2017) makes the case that plants are an often ignored, under-appreciated and yet extremely intelligent life form that has the ability to solve human sustainability challenges and even can teach us how to better govern ourselves. Mancuso is an associate professor at the University of Florance and directs the Laboratorio Internazionale di Neurobiologia Vegetale (International Laboratory of Plant Neurobiology, or LINV). Mancuso’s chief hypothesis can be summed up as follows. Animals can move so they escape from problems. They can run away from predators. They can migrate away from adverse environmental change. In contrast, plants are sessile (fixed in one place). Therefore, plants have no choice but to actually solve problems, and hence engage in forms of intelligence to devise and implement solutions that are sometimes obvious, yet other times subtle or downright devious. Mancuso asserts that plants by necessity have developed intelligence that differs greatly from animal intelligence. Animals have a central brain, which is a suitable strategy for animals who can get out of the way of destruction. Plants cannot directly escape trouble. They have to survive partial destruction of a magnitude that would kill most animals. For example, plants and their intelligence mechanisms often get partially eaten. Plants have overcome this existential challenge to their intelligence by utilizing extensive redundancy and decentralized intelligence. For example, acacia trees has developed a solution to discourage predators involving excreting nectar along their branches. That nectar attracts ants who discourage harmful insects from attaching the tree. The subtle element is that the nectar also contains chemicals that make the nectar highly addictive, hence enslaving the ants to the tree. The devious element is that the nectar also contains drugs that make the ants so frenzied and aggressive that they will attach much larger animals who approach the tree. Mancuso takes passionate joy from pointing out that plants are not the mere servants and victims of animals, but often the actual master of animals. Although this could be dismissed as mere professional bravado to position oneself as the alpha biologist at conferences, Mancuso makes a compelling case. Another example, relevant to space travel, concerns humans being one of the best spreaders (“carriers”) of plant species. Humans have spread local plant species such as potatoes, tomatoes, cocoa and coffee plants across the globe. 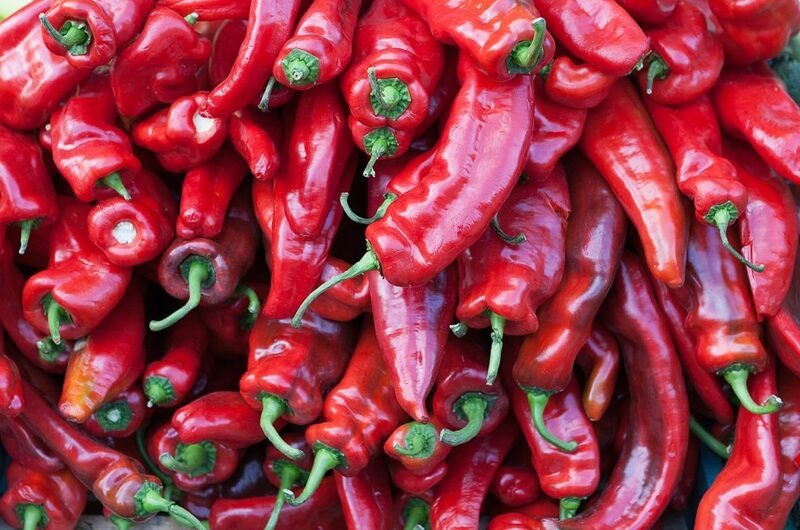 One poignant example is that of chili peppers, which originated in a region in Mexico. Chilis are painful to eat, but that pain releases highly addictive endorphins in humans. Chili plants have in essence manipulated humans to cultivate chili peppers across the world, to such a degree that chilis, in a just few hundreds of years, have become such highly traditional foods in many cultures that is is difficult to image such cuisines without chili peppers. Now that humans are already transporting plants into space, it is to be wondered at what transformations plants will invoke upon future spacefarers. Plantoid capable of sol exploration. Credit: plantoid project. Mancuso also feels that plants hold lessons for future space exploration, since they have redundant, fault-tolerant systems and structures and use only low amounts of energy. 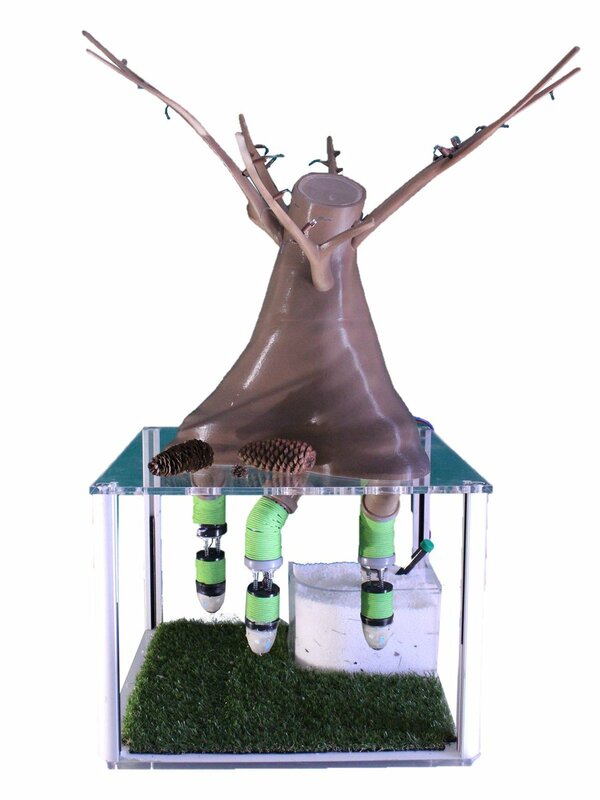 He has worked with the European Space Agency to study how decentralized root growth intelligence and mechanisms can be used to create a network of soil explorers comprising “plantoids” (robotics inspired by plants) across the Martian surface. 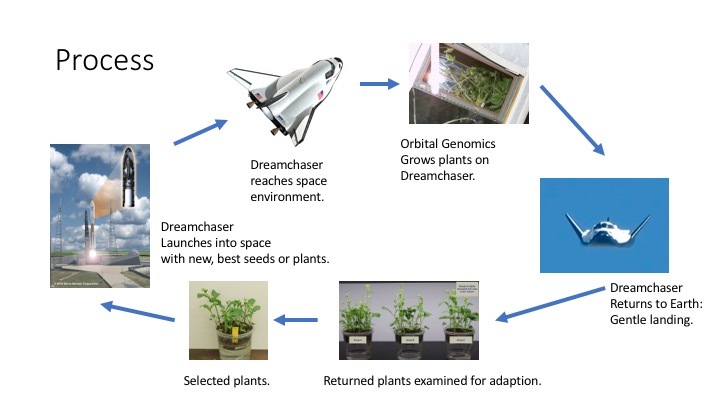 So someday there could be robotic plants in space, perhaps carried by robotic humans! Human use a lot of water for drinking and hygiene. Recycling is a key strategy to make the water that is launched into space last longer. Existing water recycling methods in space use harmful chemicals or considerable energy, and do not recycle 100% of the water. Reliability is crucial as well. So the search continues for new approaches to improve the water recycling process. NASA is considering capillary structures for water recycling. Capillary action involves electrostatic forces literally pulling water through small tubes, similar to how drops of water will hang on objects despite the force of gravity pulling them away. 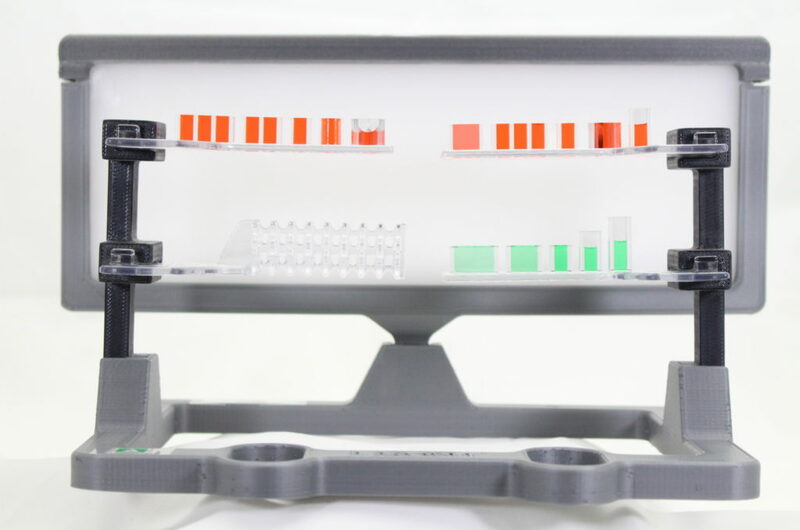 NASA’s capillary structures investigation studies “a new method of water recycling and carbon dioxide removal using structures designed in specific shapes to manage fluid and gas mixtures in microgravity.” The capillary structures equipment is made up of small, 3-D printed geometric shapes and sizes sizes (see above image). Just as with the capillary investigations, the evaporation “structures are set up to have different geometries, different angles, different heights, all these different parameters that we are varying across these structures to get quantitative data of evaporation in low gravity,” according to Kyle Viestenz, co-investigator for the project. Another part of the investigation demonstrates the use of fluids in a carbon dioxide removal system, called the Carbon Dioxide Liquid Sorbent System. This system uses a network of “water falls” to bring a material used to absorb gases, into contact with air, allowing the carbon dioxide to be carried away by the liquid. In a microgravity environment, the liquid does not “fall,” but is driven by surface tension forces generated passively by the unique surface geometry of the capillary structures. It is unknown if or when this technology would be deployed. 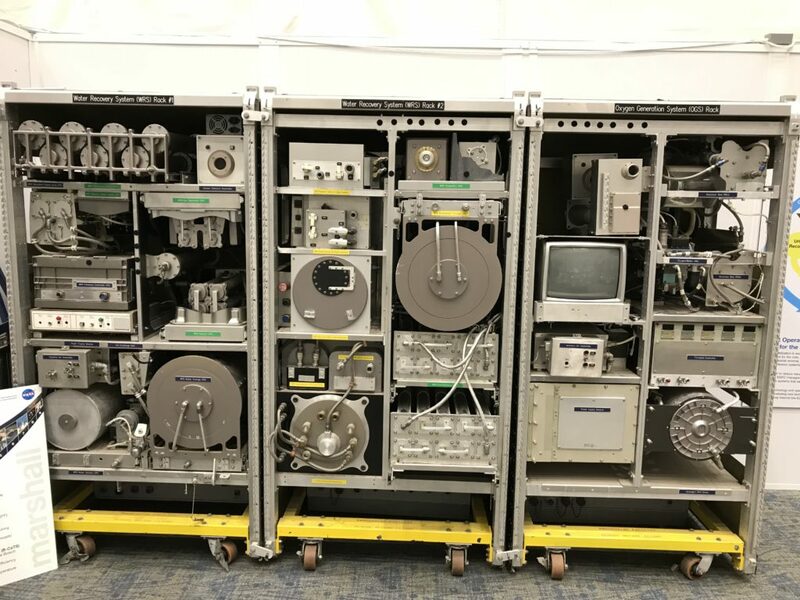 NASA ISS water recovery equipment at Marshall Space Flight Center. Credit: SustainSpace. 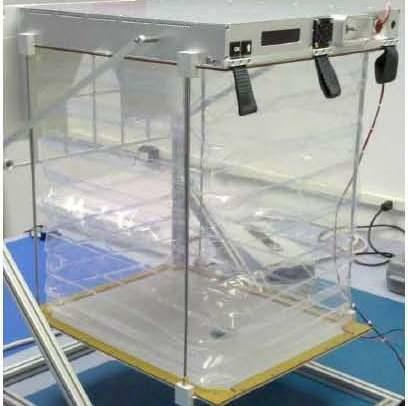 SustainSat is a platform that can be used as either a prototype for CubeSats or as an Earth-based sensor and data-logging platform. It is intended as a low-cost, barebones way to learn about the general categories of technologies used in cubesats as well as to use those technologies for sustainability purposes on Earth. SustainSat is built around the Arduino prototyping platform. It is different from ArduSat in that it is not specifically set up for use in space. 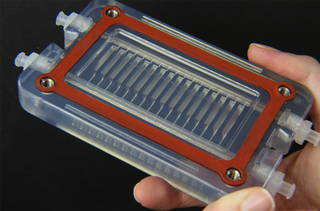 SustainSat technology can be adapted for space, such as through ArduSat. However, SustainSat provides devices ready for use on Earth or on balloons and kites. It is perhaps the lowest-cost, simplest way to explore satellite technology in a sophisticated way, while empowering users to create and adapt real devices. The simplest form of SustainSat is a simple light monitor, such as for sunlight, combined with an inertial unit. Such a device is similar to a real device that monitors solar luminosity, or a 1 pixel space telescope. It provides guidance data for potential reaction wheels or thrusters. More sophisticated forms of SustainSat include wireless transmitting and data logging capabilities, as well as other sensors. 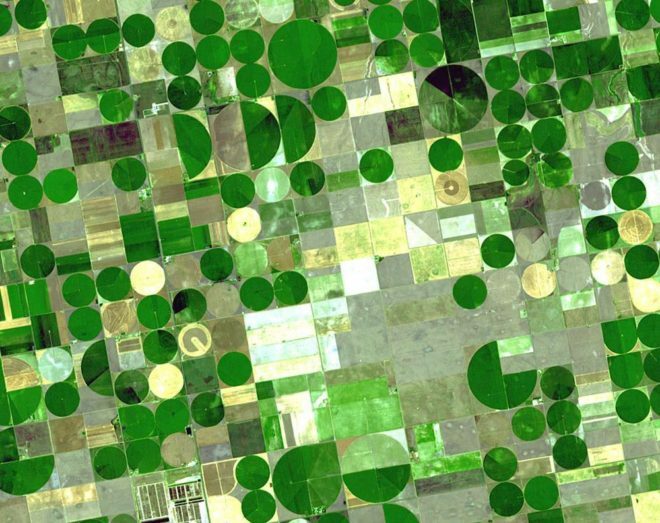 A version of SustainSat that can capture hyperspectral information is under development. 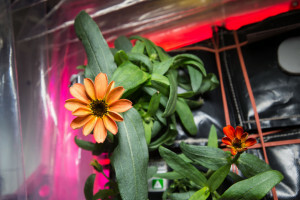 Commander Scott Kelly (Expedition 46) shared photographs of a blooming zinnia flower in the Veggie plant growth system aboard the International Space Station (16 January 2016). “Yes, there are other life forms in space! #SpaceFlower #YearInSpace”, Kelly wrote. This flowering crop experiment began on Nov. 16, 2015, when NASA astronaut Kjell Lindgren activated the Veggie system and its rooting “pillows” containing zinnia seeds. 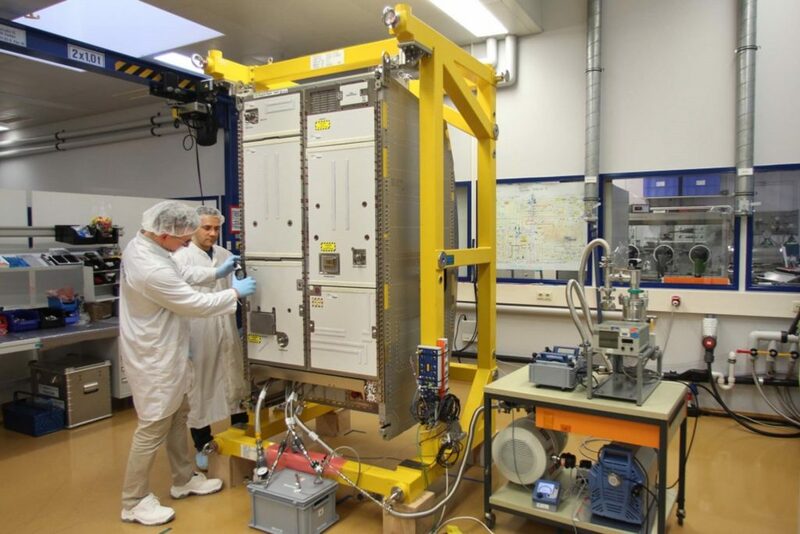 The Veggie provides lighting and nutrient delivery, but utilizes the cabin environment for temperaturecontrol and as a source of carbon dioxide to promote growth, according to NASA. 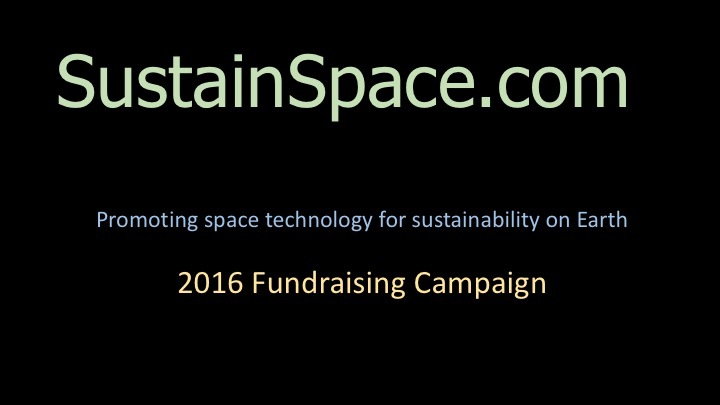 SustainSpace has kicked off its 2016 Fundraising Campaign. This campaign will provide funding to new writers and seed grants to students and others who are working on related products. Help SustainSpace continue the mission to promote sustainability and space. Donate here today!